Several gateway areas were identified during the planning process, including major gateways into the downtown area, but also including community gateways located on the major highways at the Town of Halifax boundaries. The plan recommends a simple sign consistent with the overall public sign design themes at the Town boundaries on all of the major roads into the Town. In addition, three major gateways into the downtown area were identified. Reduce the number of highway identification and directional signs as much as possible, and organize them in groupings with attractive supports in order to reduce the visual clutter of the corner. Relocate the overhead utilities around the Veterans Memorial and the Intersection of Mountain Road and Main Street. Improve the Town of Halifax parking lot on the north side of Mountain Road with additional frontage greenspace and trees. Improve the site conditions of the buildings at the intersection, reducing the curb cut length and adding greenspace enhancements. The buildings themselves require only minor façade improvements, but the sites present an expanse of pavement and undefined curb line. An alternate recommended improvement for this gateway area is to close the connection of Maple and Mountain Road, providing access to Maple only from the connection to Main Street north of the Mountain Road intersection. This would improve the appearance of the intersection area, and more importantly, would increase the safety of the intersection for vehicles and pedestrians by removing one of the offset intersecting streets. It would also reduce cut-through traffic in the Maple Road neighborhood. Detail plans of the recommended gateway improvements as well as of the alternate Maple Avenue closure follow. Provide a gateway sign on the Town side of each bridge. Organize existing highway identification and directional signs to reduce visual clutter. Southern Gateway. The Southern Gateway to downtown was first considered to be located at Toots Creek and the railroad crossing. The plan recommends, however, that the formal downtown gateway be located on Main Street north of the railroad crossing. A curve in the road at the transition from the more intensive gas station and restaurant businesses to a more residential character provides a better transitional area into the downtown. It is critical, however, to clean up and enhance the Toots Creek bridge and railroad crossing area. A major issue with the appearance of the approach to the downtown area is the Roller Mill located on the east side of Main next to the railroad. While the structure is of considerable historic interest, it is very dilapidated and has a negative effect on the perception of the Town. Although there has been some consideration of renovating the building for a new use, it is difficult to reuse the building due to the lack of parking for business use. It is important to go beyond stabilizing the structure, and to actually improve the appearance or else to remove it. 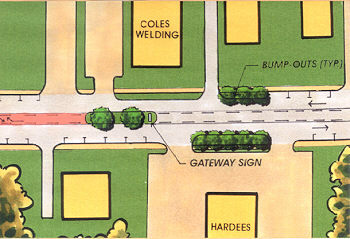 Provide a wide median in Main Street with a gateway sign, trees, and seasonal planting. Slow traffic with chokers along the parking lane south of the median island and sign, including enhanced plantings along the front of Hardees and the residence on the east side of Main.